Now I guess it is my turn to write this blog. I think that I should start with an introduction. My name is Ann Lopata and I live in Berkeley California. I am 63 years old and retired as a university administrator and counselor. I volunteered at Dar Asni from February 12th through May 11th at which point I reluctantly left….hoping to return next year. I am a mom and a grandmom (two things that came in very handy in a house with 36 adolescent girls!) Having been to Morocco last year, I had some idea of what I would find but I realized quickly that I hadn’t seen the REAL Morocco. I volunteered in a program teaching English in Rabat for three weeks before I went to Asni so I began to feel a bit more confident. And while I was still in California I reviewed my French and tried to remember all the English rules. But once I got to Asni I realized that all was going to be great. But I was concerned that perhaps my skills were not up to par or that I would have difficulty communicating and bonding with the girls. From the first minute that I met them I realized that my fears were groundless. What an incredible experience this has been. I feel honored that I have been given an opportunity to be a small part of these girls life. 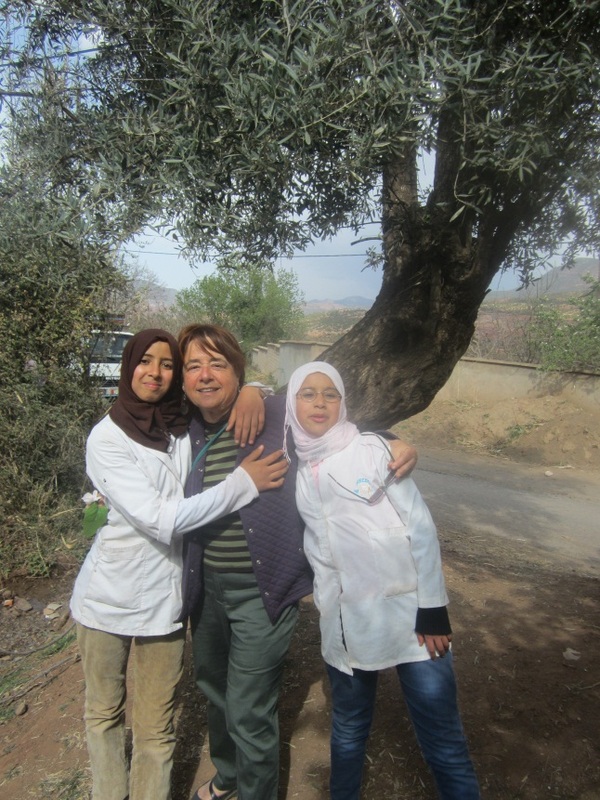 I have loved being in Asni with Latifa, the wonderful housemother who has become such a close friend and Latifa the cook and Mina the housekeeper. It is great to see how they all work together as a team and it was wonderful to be able to pitch in and be part of that team. 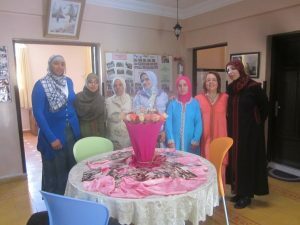 I loved helping Latifa, the housemother with shopping at the souk or in Marrakesh or visiting her family. I loved helping Latifa the cook and the girls prepare couscous and tangines and scale fish for lunches. Here is a synopsis of my wonderful adventures as they progressed with Latifa and the wonderful girls of Dar Asni. I arrived in my little room on the roof of the house in Asni on February 12, 2012, having arrived to freezing cold weather. The view from outside the room on the first morning was amazing. At night, I am snuggled in my bed with all my wonderful Moroccan blankets and am very toasty…and the water in my bathroom is hot, so who could want anything more? The girls here are wonderful and enthusiastic and love to babble in whatever language (usually Tashelhit or sometimes French) and they are just like teenage girls everywhere….they sit in corners and giggle with each other and they love Facebook and music (although mostly Berber music). Many of them dress very modern without their hajabs but when they go home they always wear them. The girls take out their rugs and pray wherever they can find a spot….sometimes it is difficult to not step on them. They work very hard on their studies and go to school from 8 am until 6 at night with breaks in between for lunch and some other activities. I have sessions scheduled with different groups throughout the day and while we are just at the introductions stage, I can see that it is going to be very challenging to adjust to the different groups. Some of the girls who are 12 and 13 are just beginning English and the older ones who are 16 and 17 have studied it for a while. I can tell this is going to be a wonderful challenge. 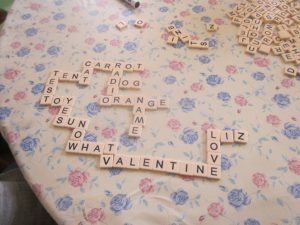 I brought material for friendship bracelets which are a big hit as are the French and English versions of Bananagrams that I brought. While they all want to learn English, French is definitely what they need so I have scheduled more French classes with the younger girls and more English with the older ones. They work so hard in school. I hope that we can just have fun with some of the language classes. I got to experience rural life in Morocco. We lost both electricity a few times (hence heat and lights and most importantly, internet) and water. I was concerned the first time but when I went downstairs in the morning all was calm and it always came back on. This is where Inshallah (in the name of Allah) comes in handy. One never knows what the future holds but it all works out in the end. We just waited out the day in our gloves and coats and of course, it came back on about 4 PM. But it will probably go out again tomorrow.My days are wonderful with the girls. They are so enthusiastic, particularly about English that they wanted extra time scheduled. Being here is already so much more than I imagined. The girls are like sponges and each one is sweeter than the next.I’ve already decided to extend my stay here and am asking for permission to stay through the beginning of May. That will allow me to be here through Open Day and help the girls prepare for their end of the year exams. And I already don’t want to leave them.We work hard during the day and play in the early evening between school and dinner. I have taught them the song “We are the World” and everyone has taken to it enthusiastically, even the little ones who don’t know any English. Latifa had some of the older girls translate the words into Arabic so that the girls could understand what they were singing. And I talked to them about the purpose of the song to help starvation in sub-Saharan Africa. We hope to perform the song at the Open Day event in April but if that isn’t possible, at least we have fun performing it for each other. The girls love any kind of music or singing or dancing. I taught them the Macarena (see the picture below) and it has become a staple of our life here. And we even have taught it to some of the school groups that have come to visit!! They go home every weekend after school on Saturday. After working so hard during the week, they go home and work all weekend cleaning the house, helping with the cooking etc. Their parents pick them up when they come into town for the weekly souk (huge market) in town. As they all left the house there were lots of kisses…left cheek/right cheek and then a little giggle. One weekend Latifa, Gretchen and I went into Marrakesh to do errands. There isn’t much that you can buy in downtown Asni where there is now a bank (opened two days ago), a cafe, two little groceries, and mobile phone store, a butcher and not much else. We even now have sidewalks which have been installed the last week. I realize that I have to keep modifying my schedule with the girls to accommodate their schedules and different needs. . My day begins at about 9 and I now see girls throughout the day. In addition, in the evening from 8-10 I stay around and help the girls with homework. They all gather in the salon around 4 tables and do their homework. Or they come into the computer room and meet with me. It gets very loud and animated as you would imagine. There is a lot of variation in the preparation level even within the same grade. Then I crash in my bed at night!! We have so many school visits at Dar Asni and I do most of the tours for the English speaking groups which is fun. I have been both a host and a visitor this month. I had to entertain some nurses from England who were doing some immunizations in the town of Imlil and then in the afternoon, after deciding to accompany some of the older girls to the lycee for a special English class that they were having, I was invited into the school and into the classroom. The English teacher is Moroccan but studied for a year in the US. He asked me to speak to the class and I think that the girls were really pleased that the students seemed to be very interested in what I had to say…they told everyone about it when we came back to the house. The students in the class asked great questions: one asked if I was Muslim because I was wearing a headscarf which I had just had one of the girls put on me that morning…I forgot I had it on; one asked me about US views of Muslims and another asked me if, since I had been to Morocco twice, I was going to move here permanently. And they wanted to know a lot about California…oh and they wanted to know my age. It was a wonderful hour and I hope that I am invited back. The hour before dinner has now become singing time. They are so enthusiastic that they practice it over and over again and during the day I will go up on the roof (the hangout) and hear groups of girls practicing without music. I even walked into town with some of the older girls and they spontaneously broke into song. The girls love anything Indian and we listen to Indian music and they watch Indian movies. Not going to do Bollywood dancing though….I am too old. I take lots of walks with the girls each day. One weekend we walked up into the hills to visit one of the girls relatives and spent several hours just going from house to house visiting relatives. It felt like each girl had a family member in this little town. Anyway, they love to walk and it is always another opportunity for pictures which they also love. On March 8th we had a big event in Dar Asni for International Women’s Day. The girls made posters. I talked to them in English and French class about the meaning of the day in the US and the rest of the world. 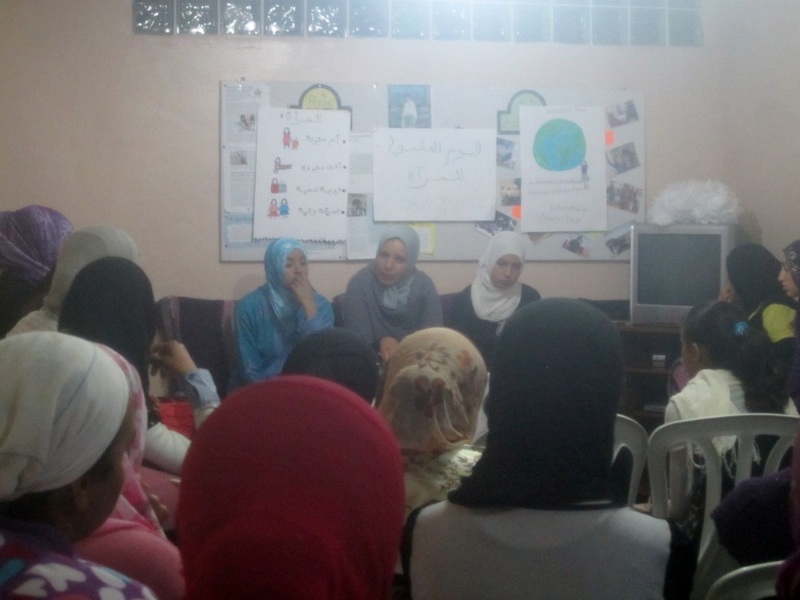 And in the evening Latifa talked to all the girls about the Mudawwana, the 2004 law which gave women additional rights and protections. She talked to the girls about the importance of having pride and respect for themselves. She talked about the opportunity that they have being in this house and working so hard to try to be an example for themselves and their families and communities. She talked about the need for women to be able to support themselves. I was told all of this through one of the girls since she did it totally in Tashelhit. All of the girls participated in the discussion and it was wonderful to see. But it wasn’t all serious. One of the older girls organized the younger ones to put on skits. Anyway, it was fun to watch the girls in a different way…just acting like silly teenagers. The older girls then gave out awards to the girls for things like best marks in the house etc. During the day we all prepared macaroni and cheese because I wanted to have them experience a typical American meal. It turned out surprisingly well. While it certainly wasn’t all American Mac and Cheese (with powdered milk, farina, no Parmesan Cheese) the girls thought it was great. Then we all played music danced for hours. We also had a visit from a school in London (we get visits at least once a week). There were 5 girls, five of whom were Muslim…two from Libya, 1 from Pakistan and one from Somalia. The fifth girl was half Ukranian and half Nigerian. They played music with the girls and games and we all danced the Macarena and sang We are the World. It was a great afternoon. There is now another volunteer in the house. She is a retired French teacher from Belgium and will be working with the girls on their French which will give me a break for a little while and I can concentrate on the English and helping Latifa. She’s only going to be here for three weeks until the girls go on vacation. I spent the three days at another house in Ouirgane which is about 15 km from Asni. Gretchen and I had the opportunity to compare teaching styles and help each other with ideas for working with the girls in both houses. The girls’ holiday is starting soon and we are all concentrating on preparing for exams. I am going back to the US during the two week break . We all got caught up in the need to return to a sparkling clean house when we get back and everything was scrubbed down by all of us. I figured since I didn’t have to clean my house…..why not do it here….and it felt good pitching in and doing stuff with the girls. April 29th was the big Open Day event. The house was scrubbed….and Latifa and the girls made lots and lots of food. 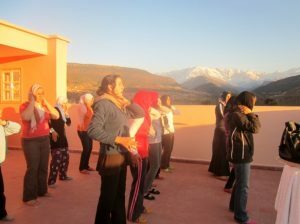 We had an open house at Dar Asni first and then went to the Kasbah du Toubkal with the younger girls to continue the event. It was so great to see the girls so excited about the day wonderful that they got the opportunity to interact with the girls from the other houses. And lots of volunteers from past years came to the event which was wonderful for the girls to reconnect with them. Unfortunately I’m nearing the end of my stay here. I have been spending a great deal of time organizing things in the volunteer area. I made inventory of all volunteer supplies which will hopefully be helpful to future volunteers. And we are all looking for ways to relieve the stress that the girls are under. That means lots of walks and laughs and football games in the back of the house. 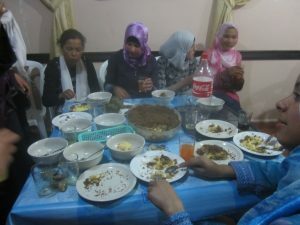 Latifa and the girls planned a big party for the night before I left. And we danced and danced again…how wonderful it is to see the girls so relaxed and having so much fun. 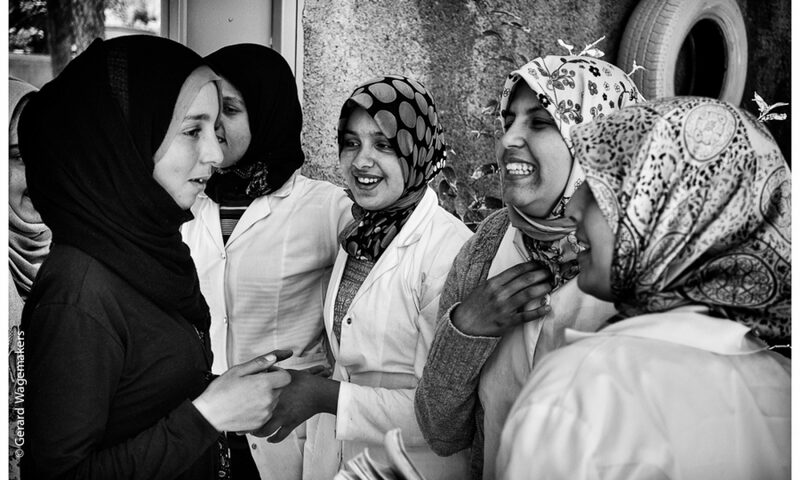 This is the image that I will take with me…their lovely smiling faces.